It all started last May 2011 after successfully passing through a screening comparable to the “eye of the needle.” And it ended with a march last March 17 at the Prayer Garden in Bunlo, Bocaue, Bulacan. Finally, after 10 months of academic and on-the-job training, the first batch of the Bro. 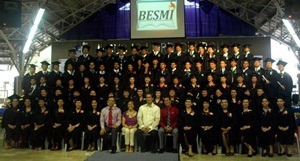 Eddie School of Ministries International (BESMI) had their graduation rites. BESMI’s pioneer 82 students are now known in the Jesus is Lord (JIL) Church Worldwide’s history as the “Passionate Batch.” For these students, passion means to love and serve the Almighty God faithfully and without reservations. Regardless of the cost. 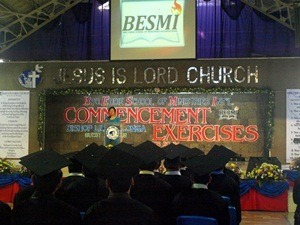 The graduation rites marked the end of BESMI Stage 1 or the Training Stage. During this stage, BESMI students defied distances and circumstances and literally travelled miles, crossed the seas and braved the weather. They left their families for a while. Many also took a leave from work and a number opted to resign from their jobs! All these to heed God’s call. Being BESMI students had sacrifices, yet they did not falter. Their BESMI journey began in the classrooms with teachers who had extensive Ministry experiences. 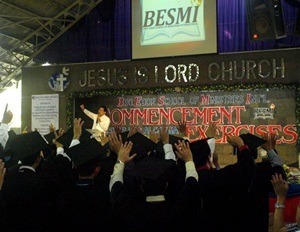 These teachers were led by no less than the JIL Spiritual Director and International President, Bro. Eddie C. Villanueva. Other teachers were JIL International Vice-President Dr. Dory Villanueva and members of the JIL Executive Management Board (EMB): Ms. Joni Villanueva-Tugna, Rev. Joey Crisostomo, Rev. Bobot Bernardo, Rev. Domeng Rivera, Rev. Alex Garcia, Rev. Virgie Hernandez, Ms. Soc Garcia and Sis Edith Mendoza. 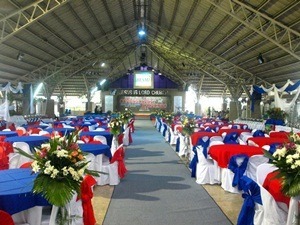 JIL pioneer pastors, Ptr. Dino Tobias and Dr. Amor Adela also joined the roll of teachers. Through classroom lectures, BESMI students were equipped with fundamental Biblical and theological knowledge. They learned more about God and the Church and they grew in their understanding of service and ministry. These classroom discussions motivated them to serve God more passionately and in many instances, these discussions turned to be sessions for intimate encounters with God! After the equipping in the classrooms, they were commissioned to on-the-job trainings in JIL Churches where they exhorted, preached and ministered. This experience made them understand what it means to be pastors and ministers of God. Actual field work for evangelism then followed. They ministered outside the confines of the church. They planted trees, fed children and ministered to poor communities in Bulacan. They also ministered to our brothers and sisters in the Correctional Institution for Women and in Marikina City Jail. 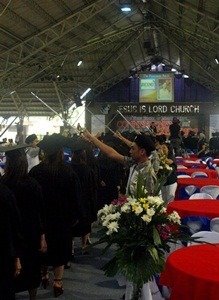 And they prayed for the cancer patients of the Philippine General Hospital. To wrap everything up, the Training Stage held a two-day Culmination Camp/Holy Spirit rally last February 24 and 25, 2012 where the students underwent a spiritual confinement. Challenged to a higher level of service, they recommitted and rededicated their lives in service to God and to the JIL Church. But their BESMI journey does not end here. This June, selected graduates will be progressing to Stage 2 or the Categorization Stage where they will be trained and honed according to their gifts and calling: Bible teachers, pulpit ministers, evangelists, missionaries, church planters, or pastors. For the Passionate Batch, the finish line is still a long way off. But, passionate as they are, they will carry on regardless of the cost. Their battle cry, after all, is “to finish the race and complete the task” God has given them (Acts 20:24). This is BESMI Batch 1. Faithful and unreserved in their love and service to the Almighty God. PASSIONATE. 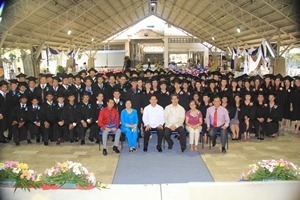 The 82 graduates, with guest speaker Bishop Leo Alconga and his wife, Sis. Elsie Alconga, BESMI Director, Rev. Joey Crisostomo, and EDD Director, Rev. Bobot Bernardo.